Thrustmaster proudly presents the TSS Handbrake Sparco Mod racing controller, born of the collaboration between Thrustmaster and Sparco. Two modes are available: progressive handbrake and sequential gearbox, delivering enhanced control during even the most intense races. A progressive handbrake mode, for superior control when turning and drifting. A sequential shifter mode, for controlled and responsive gearshifts. The TSS Handbrake Sparco Mod is 90% metal (steel and aluminum). It features high-quality components, such as technical bushings made in Germany and industrial-class flat coil springs with 8.8 lbs/4 kg resistance. It also features Thrustmaster’s H.E.A.R.T: HallEffect AccuRate Technology, a mechanism based on contactless magnetic sensors offering precision that won’t decrease over time. 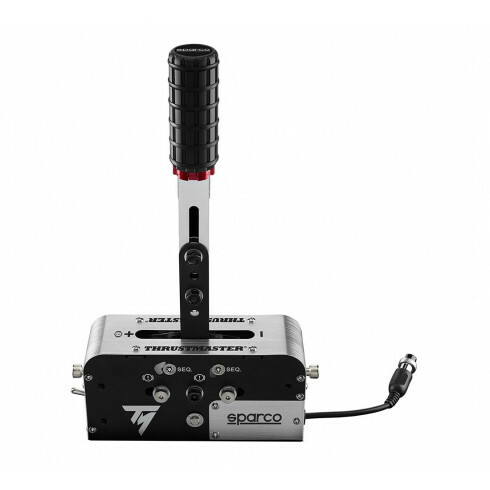 The TSS HANDBRAKE Sparco Mod is compatible with all currently available wheels for PC, from all brands. For an optimum racing simulation experience, it is recommended with the following Thrustmaster wheels: T500 RS, T300 Series, TX Series, TMX, T150, TS-PC Racer, T-GT. Also compatible with Thrustmaster Add-On* devices (T3PA and T3PA-PRO pedal set, TH8A shifter, etc.). Progressive handbrake/sequential gearbox, detachable gear lever knob, Allen mini-key, Allen key, wrench, detachable DIN/USB cable, user guide and warranty information.